Owning a business is both challenging and rewarding. It can also result in unexpected costs, many of which relate to the benefits offered to employees. Offering various benefits beyond a salary or hourly wage can help make your business more desirable for potential employees and can help to retain skilled workers. At times, clerical errors and miscommunication can cause employees not to receive their expected benefits. In these situations, Employee Benefits Liability Insurance can help cover the cost of claims made against you or your business. This type of insurance is specifically designed to cover businesses and their benefits employees. Employee Benefits Liability Insurance is often offered as an endorsement to a Commercial General Liability Insurance policy. What Is Employee Benefits Liability? This policy is strictly defined to specify only employee benefits. It is often confused with other kinds of policies, including Fiduciary Responsibility Insurance. Unlike other insurance policies, Employee Benefits Liability Insurance only insures a business and its benefits employees in cases of negligence, error or omission in the management of a benefits plan. It does not insure for the expected return of an investment vehicle. This policy is a claims-made policy. This means that it covers claims made during the coverage period. This is not to be confused with occurrence policies, which can cover claims that are made outside of the period of coverage. Many Employee Benefits Liability Insurance policies also have a retroactive date applied. This type of insurance policy will cover all areas of employee benefits including health insurance, retirement plans, pensions, worker’s compensation, certain tax withholdings and any paid holidays or leave that your company may offer. Some benefits are required by law. Others are not. Regardless, this insurance policy covers claims made in the management of any benefits that a business has contractually agreed to give and manage. Do I Need Employee Benefits Liability Insurance? This policy insures against claims made by current or former employees who believe that any form of benefit outlined in their contract was not properly managed on their behalf. This could mean anything from a current employee whose health insurance enrollment was accidentally delayed or deleted, to a former employee who believes the pension plan is not accurately reflecting his or her proper years of service. These insurance plans will typically have a certain deductible, and will cover a specified amount incurred by current and former employees. Employee Benefits Liability Insurance is strictly defined. Coverage with this type of insurance policy is limited to claims made about the mismanagement of an employee’s benefits. What Are the Limits of Employee Benefits Liability Insurance? This insurance policy is strictly limited to covering both legally required and optional employee benefits. Health insurance, for example, is often not legally required. Many businesses offer subsidized health insurance plans as a benefit of employment in order to attract and retain higher quality employees. A common misconception is that employers must offer benefits to full-time employees or after they have reached a certain size. However, the Affordable Care Act only specifies the employers with over 50 full-time employees provide health insurance, or pay a penalty. 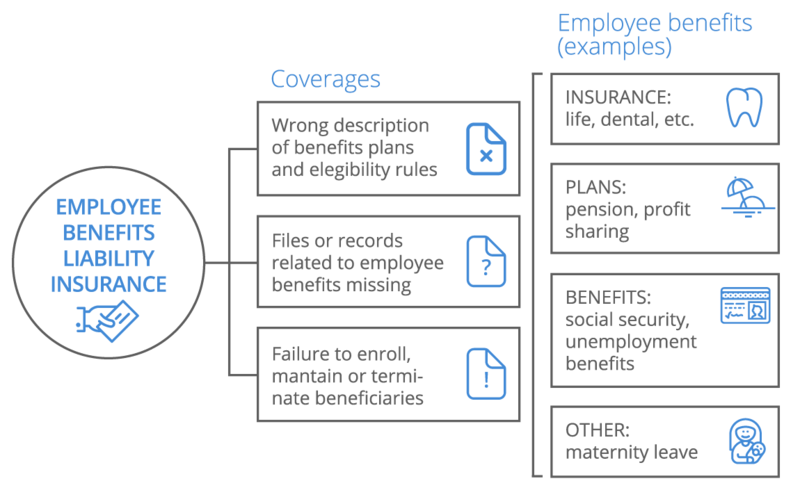 Health insurance is still one of the most common benefits businesses offer that results in claims against an employer. Health insurance, among all other benefits, is a common target for benefits claims. While this insurance policy will cover some of the costs incurred in the situation of a mismanaged benefit, it may not cover all of the costs. Liability limitations may apply on a per-employee basis as well as a liability limitation amount for all employees as a whole. A deductible of at least $1,000 is common. Employee Benefits Liability Insurance also has a retroactive date applied. This date may be the exact date that this endorsement is added. It may also be a date after the policy is enacted. However, any claims made before the retroactive date will not be honored by the insurer. As a claims-made policy, this type of insurance will not cover any claims made after the policy has ended. Furthermore, this policy is strictly limited to monetary-based benefits, and will not cover many uncommon types of benefits. This includes the quality-of-life benefits increasingly offered by many technology start-ups, such as free coffee and food, on-site yoga or on-site massages. How Much Does Employee Benefits Liability Insurance Cost? Costs for these policies vary. How many employees that are covered by the policy will affect its total cost. At least a $1,000 deductible can be expected for all claims that are made. This type of insurance is known to be one of the most affordable types of insurance policies that a business can purchase.